”Harjumökit” is a place to take a sneak peek into locals ‘everyday life. This family-owned accommodation spot is a secret waiting to be unrevealed: live like the locals with the locals! The hosting family runs these cute cabins and accommodates visitors in the very proximity of their own home. 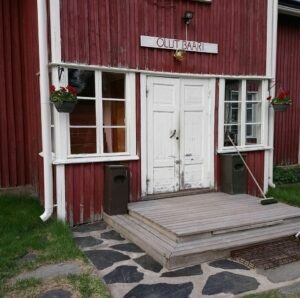 Stop over to feel the hospitality and unpretending style of living in a small Lappish village. The lake offers activities both winter and summer, sauna is always on demand and the forests enchants with its peacefulness. • 3 small cabins available from May to September. One of the cabins is suitable for allergics. 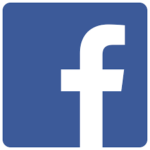 • Caravans and campers are welcomed to stay with us! 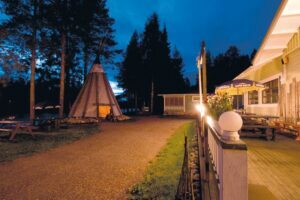 An idyllic courtyard with a camping site on the shore of Lake Simojärvi next to fishing waters, hunting opportunities and a forest for picking berries. The holiday cottage for rent by Lake Simojärvi sleeps 6; lounge with kitchen, fireplace, bedroom, toilet, sauna, shower and TV. 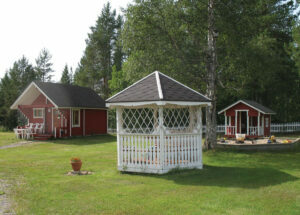 In summer, there is another cottage for 3 persons, a camping site with electricity and a sauna. The main building houses a bar, featuring karaoke evenings in summer, for example. Gulo Gulo has holiday apartments in semi-detached houses. Each apartment is stylishly furnished, with a fireplace, sauna and kitchen with all modern conveniences, and of course a terrace with a forest view. The two apartments in any villa can be combined to form a single holiday accommodation that sleeps 12. In the grounds there is a lean-to where guests can sit by an open fire and listen to the sounds of animals. Nearby RanuaZoo offers unforgettable experiences such as encountering a polar bear in the morning before opening hours. Guests of the Holiday Village are granted access to the Wildlife Park for a single fee for the duration of their stay. Husky rides, reindeer rides, snowshoe treks and snowmobiles are available in the Holiday Village itself. Gulo Gulo is open every day. The RanuaZoo Camping provides a convenient caravan and tenting place in the immediate vicinity of the Ranua Wildlife Park. You can stay through day and night, and the sauna is warm every night. The area includes a kitchen with dining space, a barbecue grill, saunas and showers, washing machine, children’s playground, and septic disposal. The Wild Arctic Restaurant, Fazer-confectionery as well as other shops at the Wildlife Park complex complete the RanuaZoo Camping services. In addition to the services of the Wildlife Park, the nature-trail with the cots and lean-tos along the way offers extra adventures in the immediate vicinity of the Camping area. The service provider Wildlife Safaris, located on the Park premises, offers hiking-, fishing- and canoeing treks in the nearby wilderness. If you arrive outside the opening hours, the fee is to be paid the next morning. 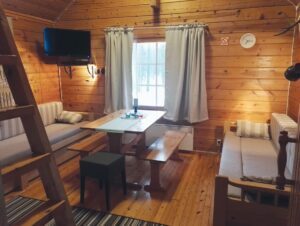 The Lake Ranuanjärvi Camping is excellent for you looking for an advantageous and peaceful accommodation with lake-side views! 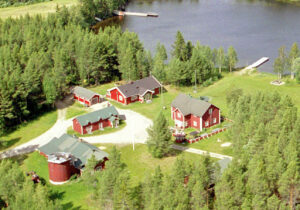 The Ranuanjärvi Camping is located right in the vicinity of the Ranua centre. The closest Supermarket is about 2 km and the Ranua Wildlife Park 5 km away. At the Camping area you have the choice of tenting- or caravan places or cottages for rent in the summer. Children will be delighted of the sandy beach on the shore, children’s playground and trampoline on the premises. The mini-golf course and rowing-boats for rent offer recreation opportunities for adults. The choice of two saunas in the area is available upon reservation also. wildlife, is nearby. An excellent place for rest and recuperation for companies, groups and individual travellers in the midst of unspoiled nature!